Who coaches the PP at SCSU? For a forwards/PP coach, Smaby is probably not the guy. Though it sounds like the coaches think highly of his contributions. My friend and I got kicked off in alternating fashion while trying to watch the same game in different places. The AppleTV even forces you to log back in if you access your account on another device between uses. Thanks for checking, but no. Sorry, all were claimed. I was ok with them until the "off air" commentary about how dirty UND always is. "It's like they have a choice - go to UND or the WWF"
Non-conf record still decent, but bad against bad teams isn't helping. They need to improve conference record, and from here on out that's all we get. Maybe Wilkie can give the whole team a pep-talk about having a scoring monkey on your back. Nobody's sugar coating it at this point. Read Brad's weekend review. The team desperately needs some finishers. But a lot of their game as a whole is coming around. The crappy thing is that you can still win games by outscoring opponents in racehorse games, can't expect to win much by averaging just a goal or two a game. It'll be great when he's traded after a couple years as a "bust" in their eyes, then wins the Vezina. I don't think UND is the only team dealing with an increase of misconducts. It seems like the refs are calling more majors and misconducts this year. Duluth has had several, as has Western that I remember off hand. Wonder if it'll be like years past when that aspect of the rules is abandoned after Christmas. Denver definitely had more energy that period. But they didn't have a lot of open looks. Grade A chances were close even if possession wasn't. UND has to pick up the pace in the 3rd and maybe get one early. Great first period, score could be worse. Alex is easily the best pxp guy they've had in awhile. Color has never been all that great, but I appreciate Jake's knowledge, especially once he got comfortable. Yeah, for me it's not puck movement, it's player movement. Guys without the puck should be moving to get themselves a shooting or screening lane. It's easy to defend a power play that has several players standing still. So UND gets the bang bang plays, but usually very quick once possession is established, before they actually setup. Once UND sets up the pp, they tend to camp out. Reading this and the game thread reminded me of a stretch in, I believe, 2009 or 2010 when UND was swept at home by Michigan Tech and finished the first half at or below .500. Hak was pretty famous for lackluster first half teams. Yet there were people asking when the last time was that UND was blown out or swept during Hak's tenure. They did tend to figure things out in the second half though. 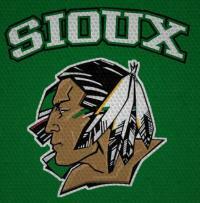 Hopefully this UND team can rally around Saturday night and finish the half strong. The exact formula Duluth used to win the Natty last year. Get a lead and hold on for dear life. They aren't all pretty.